Decades ago I had a poster on my kitchen wall that was a photo of a little girl with a kitten in front of a barn. It said, “Faithfulness in little things is a big thing.” I've never heard of anyone using an epigraph for a review before, but that’s what the poster quote is for this review of “Gathering the Grassland: A Plains Journal” by Linda Hasselstrom. I like the quote on my poster better and now I’ll try to explain why. I thought my “faithfulness” quote was from St. Francis, but Google says it was Saint John Chrysostom, a fourth century Archbishop of Constantinople. I don’t know whether that’s better or worse, but the sentiment remains true. Linda’s book is an accounting of daily things, as faithfully recorded in three sets of journals: her own, her mother’s, and her step-father’s. The problem, like the problem of the four Gospels, is reconciliation. Her mother wanted her to be pretty in pink, her step-father taught her how to run a ranch but refused to leave it to her, and she herself managed to save the ranch until today, when subdivisions threaten to overwhelm it. This last is what her epigraph reflects, but there are more twists to this story. I thought of my kitten poster because the most ghastly incident Linda tells is about moving to that ranch as a child, glorying in a lapful of kittens until a hired man named Leroy came up the walk. One of the kittens had walked off and Leroy put his big foot above it. “What if I just squashed this here kitten?” he asked. Linda dumped the kittens from her lap, went like warrior Arya Stark and kicked him in the knee as hard as she could. Losing his balance, he did indeed put his foot down on the kitten, crushing it. Linda says she doesn’t blame Leroy. I do. What made him think it was funny to threaten to kill something sweetly vulnerable in front of a little girl? It was torture of that girl. In fact, killing pets in front of children is not an uncommon kind of child abuse, implying the ability to kill the child. Some people would find a sexual motive, Leroy displacing desire for a pretty little girl in order to kill an improper emotion in himself. I find it a good illustration of the dark side of rural culture that tries to toughen up people with gallows humor. Linda claims that Leroy felt so badly that he brought her a puppy as compensation. I’m not sure I believe her. She accepts blame. But I’m not Linda. That’s the real meat of her story: her fight to stay in control, to accept responsibility, to struggle for her own justice. She’s part of a circle of rural women who write about this, each in her own way, but with deep understanding of the twists of love and hate. Mary Clearman Blew, Sharon Butala, Judy Blunt and a dozen others— for years I bought all their books. I suppose it’s post-colonial writing, since the previous generation of socially entitled men, with the collusion of “their” women, used their children as domestic stock. Linda, so far as I know, has never mentioned physical abuse other than Leroy. In fact, she loved the work she did on horseback. Aritha Van Herk, a Canadian, writes about prairie women and uses the phrase “sifting sparks from snow.” arithavanherk.com if you want to follow up on the political angle. This generational cohort of writers is nearing retirement age, but I haven’t seen obituaries yet. There are still many valuable things to say. Like indigenous tribal people, they have extended the conversation around the planet to women who live on grasslands in Australia, Argentina, Africa, the great steppes of Eurasia and so on. Thank you, Internet! One of Linda’s ploys for survival is the establishment of Windbreak House, (LindaMHasselstrom@windbreakhouse.com) which is a writer’s retreat on her South Dakota ranch. The writers who come to work there are primarily women. For Linda, and perhaps for some of them, writing is as grass, the sentences marching over the hills in rows and bunches, their roots threading deep into the sorrows of generations in search of spiritual water. They are not writing romance. They value faithfulness, reflection. What Linda questions at this stage of life is whether she could have done better. Should she have written more instead of responding to all the demands to speak or teach? Should she have concentrated on ranchwork more? Or writing more? Why did she fall in love the first time with a cheating husband just like her mother did? Should she have had children? What does it mean to be an achiever? People can resent it. Linda appreciates the Folk West: Buckskinner’s Rendezvous https://www.youtube.com/watch?v=nESxjfzMg4E and the National Cowboy Poetry Gathering https://www.youtube.com/watch?v=neLOwOjtQL8 (I know some of these people as individuals, but I don’t enjoy crowds.) She has a steady partner who does metal and woodwork in his own shop on the ranch. Now that there is freedom to write as she chooses, she uses her time quietly, warmly, leading us into each month and each day with a sky report, many dawns. She’ll stay there in her home range until as close to the end as possible. This book is part of a shelf of Hasselstrom books, a steady stream of life to share and ponder. That shelf is part of many “rooms" of journals and diaries in universities and historical societies. My own paternal grandmother, who homesteaded in Faulkton, SD, kept journals, two boxes of them. I had custody of one box for a while, read them, typed off and xeroxed some sections to send to cousins. Then I sent the box on to the only cousin who does genealogy, a retired man. I made little booklets and offered them through www.lulu.com/prairiemary. Not much reaction. I have many of the same questions as Linda. Maybe every generation has them, wondering if the youngsters can even understand what we’re talking about. Linda finds metal artifacts on her ranch and puts them all up on a railroad tie wall. 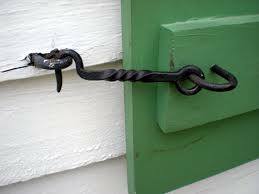 There are hooks, home-blacksmithed for catches on gates and doors. They often have a twist in the shaft, and Linda’s partner says they are for ornament, but might also increase ease in handling. This book is like that, practical, but with a little twist in the shaft. Thanks for your good and astute words, Mary. I should say that the book will probably be out in September from High Plains Press in Glendo, Wy.